When I was in the Philippines there is no need to bake at home as everything was cheaply available in a nearby specialty shop from Cakes at Goldilocks and Red Ribbon, Donuts at Dunkin Donut and Mister Donut, Filipino Pastries (mamon, ensaymada, Spanish bread), Cinnamon Rolls at Cinnabon’s, Pretzels at Auntie Anne’s , Cookies at Mrs. Fields, Empanada at Jamaican Patties even Brownies at Brownies Unlimited. Now in New Zealand it is a bit different as we don’t have the same luxury of having those specialty shops, while we have Bakers Delight and Eve’s Pantry which bakes really good stuff the options are so limited as they are General Bakeries rather than specializing in a certain baked good, which means if you want some Brownies your limited to the normal Chocolate Variant. There might be several specialty shops as well but they are not as easily accessible compared to the Philippines which everything is within a 5km radius, that’s why sometimes it is easier to make one at home like this marshmallow brownies. Marshmallow brownies are a variant of a brownie which contains a hefty topping of marshmallow on top as well as walnuts and chocolate chips. 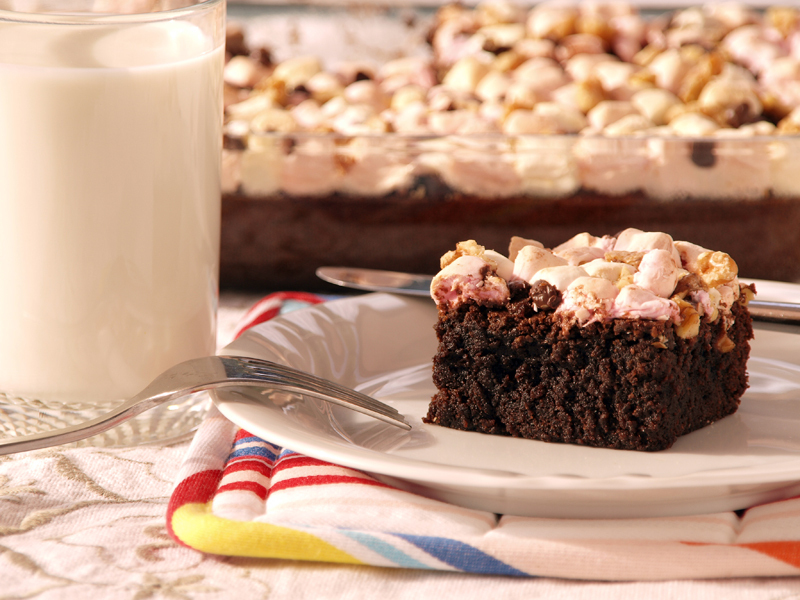 It is follows the simple brownie recipe but on the last minutes of baking it is topped with marshmallows, walnuts and chocolate chips, this process will partly melt the topping and when cooled down gives another dimension of texture to this sweet cake. This is one of the variations of brownies that I know how about you do you know of any good variants of a brownie? In a bowl, sift flour, cocoa powder and salt together. Put aside. Melt butter and chocolate in a double boiler not touching simmering water. Stirring frequently over low heat. Add 1 cup of sugar and continue to stir for 2 more minutes. Remove from heat then add vanilla extract. In a separate bowl, beat eggs and mix remaining sugar together. Once combined pour into the bowl of chocolate mixture gradually, stirring gently with a spoon or spatula. Once the eggs and chocolate mixture completely combined gradually fold in dry ingredients. DON’T OVER MIX! spread walnuts on top if desire. Pour the mixture into a non-grease baking pan. Bake for 28-35 minutes in a preheated 180 C.
Remove from oven then top it with marshmallows, walnuts and dark chocolate chips then put it back in the oven and bake for 5 to 10 minutes or until the marshmallows melts. Transfer on a rack to cool and cut into squares. Serve. This is a superb brownie, very nice and reading your sharing already making my mouth watering. I have 4 nephews and 2 nieces who would near tackle me to get hold of these brownies. This reminds me of Mississippi mud cake. My kids would devour it! Oh man!!! I have to make these! Yum. Marshmallow brownies? I’m my freakin’ goodness those look good. Those look wonderful and I’d be tempted to get out the blowtorch and toast those marshmallows too. I saw a recipe for baked smores this morning, but these look even better! Great for a BBQ or something! Marshmallow Brownies? Talk about delightful sweet taste!. One small bite should be plenty..
Wishing you and your loved one a Very Happy and Great New Year 2012. These look sinful- love the marshmallows! we dont have a normal oven. 🙁 I dont know if my turbo oven can do this also.. people say that its possible but haven’t tried it yet. i love anything with marshmallows.. I miss Baker’s Delight ! The bread from them is always sooooooo good. These brownies looks gorgeous.